It’s 4:30 pm. You have thirty minutes to finish creating a banner graphic for the department website about an upcoming conference in San Francisco, California. Where do you get that perfect photo? If you answered, “I pulled one from the internet”, do not pass Go, and do not collect 200 dollars. Chances are that photo you just grabbed from Google image search falls under some sort of copyright protection. Copyright varies from site to site and creator to creator, but the general rule of thumb is to assume that the image is copyrighted and that is not available for Public Use. Copyright restrictions are often listed in the footer of a website. Look there for information on reusing images. A lot of public institution websites allow for use of photos on their site, but will require attribution – look for links on licensing rights. Creative Commons licenses let you easily change your copyright terms from the default of “all rights reserved” to “some rights reserved.” CC licenses are not an alternative to copyright; they enable creators to modify your copyright terms to best suit your needs. Most of the images uploaded to Wikimedia Commons use CC liscenses. Compfight is a fantastic search engine designed to search photos that have been uploaded to Flickr, a photo-sharing website. 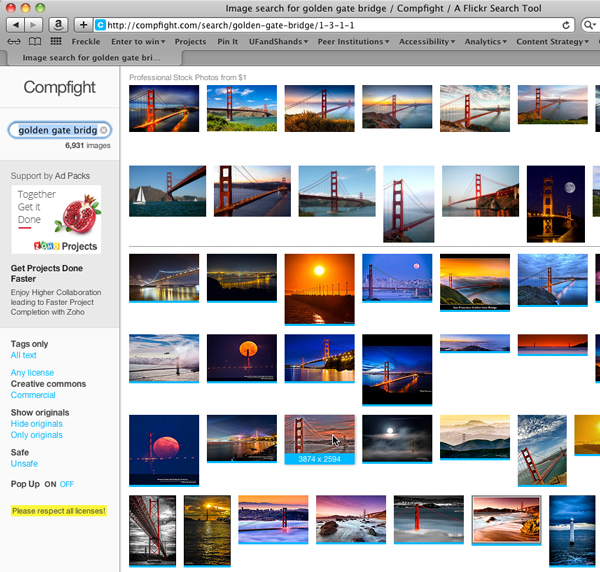 Compfight’s search provides several filtering options that go beyond Flickr’s, and allow you to search for Creative Commons only images. In the screenshot above, I went and looked for that perfect Golden Gate Bridge photo for my banner. On the left, I’ve selected Creative Commons only images. Everything above that dotted line in the search results are pay-for-use stock images, but everything below falls under the CC liscense. As you mouse over every image, the largest available download size for the image is displayed, so you’ll know if it fits in the dimensions of your artwork. Remember, the basic CC license generally asks for an attribution for the creator. Be sure to attribute the creator either in the photo caption, in the content of the post it is attached to, or written onto the image itself using a photo editing program.